The first stop on the list for our videographers was a meet and greet with the bride and groom’s entourage during their morning’s preparation for the long day ahead. After filming the wedding day’s hectic morning prep session between bride and groom, and every little detail in between, our videographers eagerly followed the bride and groom back across Toronto to our next stop, which would be the historic Evergreen Brick Works on the banks of the Don River. This unique setting is the present incarnation of what was once one of the largest industrial sites in Toronto, and which now functions as a bustling community and cultural centre. For our first time filming in this location, we were taken aback by the curious contrast between the wedding entourage enrobed in the fanciest of fashion and Evergreen’s rustic industrial and graffiti-laden setting. You can witness this interesting aesthetic combination in the highlight reel below. 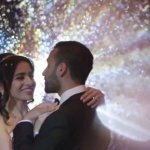 Suffice to say, with a one-of-a-kind location, and a high-spirited group of wedding celebrants, our videographers captured some interesting cinematic footage filmed for the same day edit. 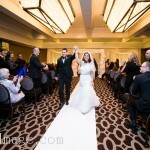 An even greater contrast would play out, however, between the earlier morning’s excitement and the solemn wedding ceremony which took place that afternoon at the gorgeous Hazelton Manor back in Vaughan. A shot by our videographers in the highlight reel shows the ceremonial venue in all its austere splendour; composed of monotone and earthen beige colours, a truly ‘holy’ atmosphere which would soon be made animated and illuminated during the ceremonies. Once Paul and Alla had completed their wedding contract, or ‘Kettubah’ in Hebrew, Paul drew a conclusion to the ceremonies with the customary ‘breaking of the glass’, and sealed the deal with his newly made bride Alla with a kiss, as the wide-eyed onlookers of friends and family drew their applause for the happily married couple on the first moments of the rest of their lives together. Come evening, the newly-wed couple stood out rightfully as they entered the reception hall, looking like movie stars to their own premier. The nights’ festivities would kick off full swing with a pre-planned dance routine performed by the bridal party of bridesmaids and groomsmen, which they had all rehearsed in secret for a month, to the smiling surprise of the bride and a perfect scene captured by our videographers. 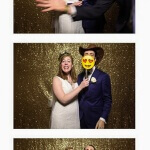 Again, true to the tradition of a Toronto Jewish wedding, there was non-stop fun and excitement for everyone. From the energetic ‘Horah’ dance that encompassed and encircled the venue, to the congregation’s lifting of the bride and groom up on chairs, symbolic of how Paul and Alla are the focal points of the celebration, our cinematographers had plenty of gorgeous shots to use for the same day edit, which was completed and played after the dinner reception ended, to the roaring applause of the crowd. In the end, as in the many Jewish weddings we’ve filmed, we were left feeling ‘verklempt’ after all the celebrations and pageantry has ended. But we were also left satisfied in knowing that Paul and Alla had a wonderful wedding day, and that our videographers and cinematographers here at SDE Weddings had helped make it memorable for them. We wish Paul and Alla the very best in their lives together, and hope that they’ll treasure the wedding day memories we helped create with them in both our same-day-edit and feature film. Mazel Tov! 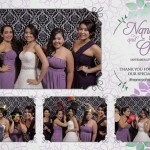 Here the highlight wedding video from Paul & Alla’s wedding.